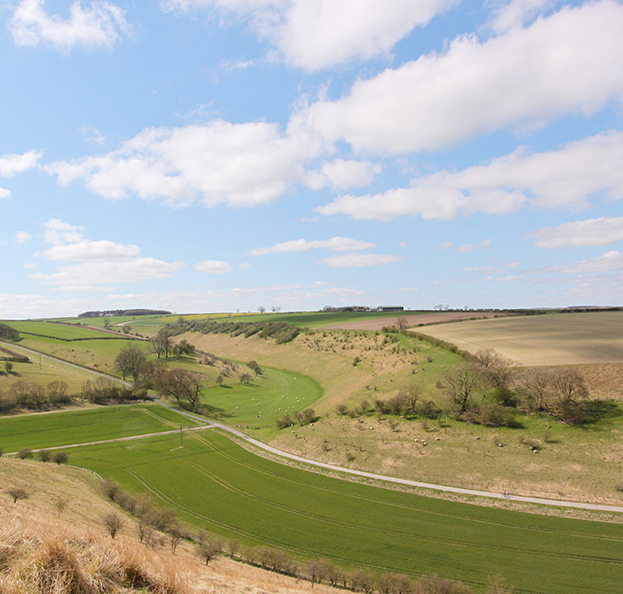 Discover some of the finest walking country in the north of England on what is arguably the most scenic circular walk through the Yorkshire Wolds. The gentle contours of the high Wolds offer fine views and in the grass dales you will find peace and solitude, along with some steep climbs. A large part of your walk is over the Garrowby Estate, owned by the Earl of Halifax. The estate straddles the busy A166 York to Bridlington road. This is an old Roman road known as Garrowby Street. There are many paths which you can link together to form interesting circular walks. Although the route can be picked up at several points, the usual starting point is Wayrham picnic site on the A166 between Garrowby Hill and Fridaythorpe. From Wayrham you head southwards towards Great Plantation. It is a pleasure to stroll through this section, as the southern end opens into a lovely grassy dale where squirrels dash for cover as you approach. The hillside is covered in cowslips in the spring. Frendal, Scoar, Sylvan, Nettle and Lily are all dry chalk valleys leading from Millington Dale. You can drop down into Millington Wood picnic site for a breather. Alternatively, head for the Gate Inn (see ‘Features pf Interest’ below). On your walk you will visit the small farming community of Great Givendale. It lies at the western end of a valley containing a bird sanctuary, and has a delightful, candle-lit church called St. Ethelburga’s. The western scarp of the Wolds overlooks the Vale of York, with Bishop Wilton tucked into the folds of the hills. The name was recorded in the Domesday Book as ‘Wiltone’, probably meaning a wild, uncultivated farmstead. The prefix refers to the time of Edward the Confessor when the Archbishop of York owned the village. The Bishop’s palace stood in a moated field near St. Edith’s Church. Built in various styles, the church contains three memorial windows to Sir Tatton Sykes who died in 1863. On your route you will pass by Underdale. The village hides in a deep hollow of the Wolds and has hardly changed since rector Bishop Thirlwall finished his History of Greece in 1834. It is a typical estate village with only one small shop and no inn. The churchyard of All Saints contains a stone coffin, which was used for many years as a cattle trough. Memorials to the Halifax family can be found behind the church. A series of climbing field paths leads to Thixendale Grange and the grass dale of the name. Thixendale village has a wealth of diversions for such a small place. There are tearooms, plus a pub and high, steep hills wherever you look. There is even an old school, which now doubles as a village hall and seasonal youth hostel. There are two stories relating to the name of Thixendale. One is that six or sixteen dales meet here. More likely, it was a Viking called Sigsten who settled here and gave his name to the valley. More green valleys lead the return along Bradeham Dale and Wayrham Dale to the picnic site at the start of your walk. The name of the Gate Inn at Millington derives from ‘gaits’. These ‘gaits’ were parcels of common land rented to local farmers. Millington Pastures were divided into 108 gaits, one gait being pasture for 6 sheep or 2 beasts under 2 years old. Two features of interest in the village are the ‘squint’ or angled window in St. Margaret’s Church, and the wheelwright’s hooping iron from the old smithy. 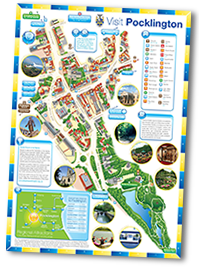 Information kindly supplied by the East Riding of Yorkshire Council.